Michael Phelps said goodbye to swimming. In his final race, he swam the butterfly leg for the U.S. team in the men's 4x100-meter medley relay winning the gold medal. His total career haul now is 18 gold and 22 total medals over four Olympics, including two record-breaking individual three-peats. Having accomplished more than any other athlete in Olympic history, Phelps is now the greatest Olympian ever. 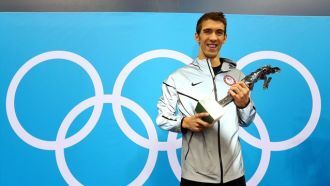 "I told myself I never want to swim when I'm 30," the 27-year-old Phelps said after his final race. "No offense to those people who are 30, but that was something I always said to myself, and that would be in three years. I just don't want to swim for those three years." The American 4x100-meter medley relay had Phelps swimming the butterfly leg with Matt Grevers in the backstroke, Nathan Adrian in the freestyle, and Brendan Hansen in the breaststroke. The amazing relay team won the gold medal, finishing in 3:29.35. Starting with the backstroke, Grevers gave the U.S. team an early lead. Swimming the second leg, Hansen yielded the lead to the Japanese team in the breaststroke. In the butterfly leg, Phelps grabbed the lead back. In the anchor freestyle leg, Adrian extended the lead of Phelps up to the finish. Japan took silver in 3:31.26 and Australia won the bronze, finishing in 3:31.58. "I felt disappointed I couldn't give them a bigger lead, but I knew that with who was at the end of the relay it would be no problem," said Grevers. "This is a moment I won't forget – being on that award podium with Michael Phelps on his final relay. He's my swimming idol. The guy is just incredible." While Phelps' blockbuster 8-for-8 performance at the 2008 Beijing Olympics may never be equalled, his four gold medals and two silvers in 2012 in London makes him both the most decorated Olympian of all time as well as of the 2012 London Games as of this time.